snake experts Melbourne, snakebusters staff Melbourne, Victorian reptiles. When people think Snakebusters, they think of Australia's best reptiles education, Australia's ONLY hands on reptiles education and of course “the snake man Raymond Hoser” and yes most of the time he’s the front man. Forget unverified claims by new reptile-show imitators, the fact is that the snake man alone has been at the leading of edge of Australian reptile science for three decades! Snakebusters staff are either also experienced in their own right or trained the right way the first time, by the master of Australian herpetology himself. So who are some of the key people? Pete Whybrow – The Snakeman of Taggerty! Decades of keeping a massive collection of all things reptile, including deadlies, both kinds of crocs and the like, his expertise is known across Australia. His main personality defect is that he breeds lots of rodents, but fortunately that helps us out quite a bit! His other half, Judy is a wonderful woman with expertise in all things wildlife, running a state-of-the-art wildlife shelter for birds, wombats and the like. Their large-headed son James, had free-handled a snakebusters Inland Taipan before his first birthday! He gets his first “snake safety” lesson after he learns to say more than “Adda”. Andrew Wilson – Keen snakie, whose favourites include Blackheaded pythons, Red-bellied Black Snakes and just to prove he’s sane Death Adders! His personality defect is that he likes motor bikes. Dylan Mullins – To us, he's relatively new to the reptile game (but that puts him several years ahead of a number of new "reptile handlers" who falsely claim years of experience). Dylan's as keen as mustard and switched on to his audience whoever they are. All the experience in the world is useless unless you are a good communicator and Snakebusters people have the perfect mix of all! Tom Cotton – Tom's house is like a frog motel! If you buy a frog in a pet shop, chances are it may be one of his babies. On the first day he worked for us an inland Taipan (the world's deadliest snake) gave him a love bite. But because the snake was one of the devenomized Snakebusters ones, nothing happened. Yes, only Snakebusters can guarantee zero risk with our "deadly snakes". Michael Smyth – He's been with Snakebusters for a long time and yet he's never been bitten by "anything!" (as of end 2009). Must mean he tastes like crap! Jarrod Bingham – Numerous claims to fame, including past positions at several major zoos and crocodile farms across Australia as well as the second hairiest feet in the reptile business. Jarrod was first trained by the Snakeman Raymond Hoser so is an asset wherever he goes. Also with expertise in plumbing, building reptile pits, tree felling and demolition, the last two usually done at the same time! PS. Also good at rebuilding houses with trees on top! Michael Laidlaw – Trained by the best, his reptile shows are always the best ... as they are for all Snakebusters staff. Never been bitten by so much as a lizard, maybe it's the fear of getting too much energy that stops the reptiles from tasting him! He's also the brains trust when it comes to cars and keeping our fleet on the road! Shireen Hoser – Dedicated wife and trainee snakie. Before she married Raymond Hoser she ran from anything with scales … including Children’s Pythons. Now she picks up deadlies like sphagetti! It was nearly divorce when choosing the name of the children, finally settling on Adelyn (Adder-lyn), like the snake and Jacky (as in lizard). Adelyn Hoser – Also known as snake girl one. Like her younger sister Jacky (snake girl 2), she was handling the world’s five deadliest snakes by age 6. By the same age Bindi Irwin hadn’t got past the Black-headed Pythons, but somehow she made more money out of her reptiles! 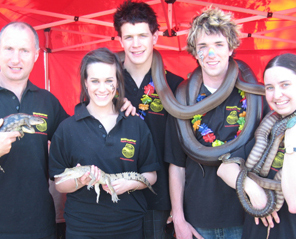 Because the kids aren’t old enough to be licenced to do snake shows, any handling they do is “audience participation”. So far Adelyn’s worst bite was from Arnold Schwartzenegger the girl Shingleback (she deserved it). Jacky’s worst experience was when Paris Hilton the Tiger Snake defecated on her (she didn’t deserve that). After that, Jacky confined herself to playing with Taipans and the Crocs. By the way, the kids are told to run from any non-snakebusters snakes! Jacky Hoser – Had to give her a line or else she’d crack the sads. Like her big sister, her expertise includes African Black and Green Mambas, Cobras, Puff Adders, Diamondback Rattlesnakes, Broghammerus, and other world famous snakes, including all the big name Aussie species. Wondermutt – Also known as Poo Mutt or Oxyuranus. The 64 kilo Harlequin-like Great Dane that everyone except Shireen loves. Famous for licking, slobbering and being ridden by kids at parties and events, Wondermutt doesn’t think he’s human … he knows he is. Shown somewhere on this webpage, he's good with snakes, but his bad habits include vomiting in the car after parties (can someone stop the kids feeding him pies?). He's also into climbing into bed with the kids and then kicking them out.